Allah SWT is Merciful. He is the owner of mercy, and the owner of forgiveness. He loves those who are merciful and those who forgive. We know these teachings of Islam, we read about them, hear them in sermons and lectures, but often this remains only a distant knowledge and not an embodiment of our character. Then all of a sudden someone reminds us that if lived properly, these traits of love over hate, forgiveness over revenge, and mercy over anger hold the power to change the world—in a beautiful way. The recent court appearance by Dr. Sombat Jitmoud in his son’s murder trial case was one such reminder. He wholeheartedly forgave the man who was responsible for his 22-year-old son’s murder and made the entire courtroom cry. He absolved the murderer from the blame and placed the responsibility on the devil for misguiding him. And he did so embodying the teachings of Islam. Power of Forgiveness vs Power of Animosity and Revenge. This father honored us all, as Muslims, as parents, and as humans. It also brought a moment of introspection and self-reflection. While it is easy to praise someone for their courage, forgiveness, and mercy, it is much more difficult to embody these traits in our day to day lives. If we can’t be merciful in our daily actions, then how can we do it when a real trial occurs? As Muslims, we are supposed to be governed by Allah SWT and His Prophet SAW’s teachings. That’s what the word ‘Muslim’ means—the one who has submitted to the will of Allah SWT. In any condition and situation, we are supposed to ask ourselves, how does Allah want me to behave at this moment? What would please Allah SWT? Unfortunately, most of us resort to much lower standards of self-gratification. If upset or angry, we succumb to backbiting, slandering, and spreading rumors without verification. All this leads to spread of mischief in the society and in the end neither we, nor our family or the ummah gains anything. Instead, we all lose. While on the other hand, a single person embodying the true teachings of Islam and spreading mercy & forgiveness can shake thousands, if not millions of hearts. Islam teaches us to hate the sin, not the sinner. 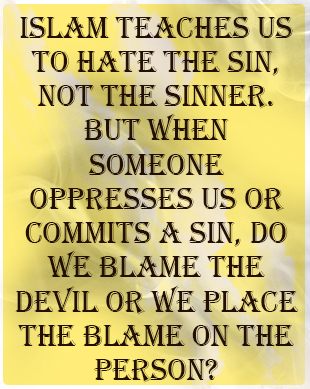 But when someone oppresses us or commits a sin, do we blame the devil or we place the blame on the person? What do you think Allah SWT loves? Taking revenge for our personal abuse or the larger benefit of the ummah? Dr. Jitmoud brought the haters of Islam to their knees with his sincere actions. He forced the mainstream media to cover his actions, and Allah SWT blessed his intention of showing the true spirit of Islam to the point millions have been exposed to the true teachings of this beautiful religion within a matter of 48 hours. This is what Allah SWT wants from us. To think beyond ourselves; to think about our eternal life; to think about the ummah and its benefit. If we succumb to anger and seek revenge for other’s actions, how will it really benefit us? Prophet SAW told us that anger is from the devil. How can any action whose very source is evil, bring goodness? If we retaliate against anyone out of anger, how can our actions be blessed and accepted by Allah SWT? On the other hand, all actions that Allah SWT loves will be blessed by Him SWT. Allah SWT loves forgiveness, He loves those who control their anger, He loves those who hide the sins of others instead of exposing them, He loves those who spread goodness and support goodness, He loves Al-Muhsineen. We are not supposed to be impulsive people. We are supposed to be thoughtful individuals with far sightedness and definitive vision. We are supposed to reflect on the outcome of our actions instead of impulsively following our whims. 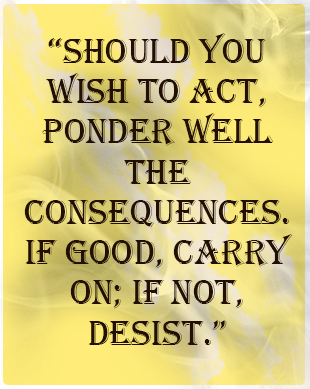 Prophet Muhammed SAW said: “Should you wish to act, ponder well the consequences. If good, carry on; if not, desist." If we forgive, who will benefit? If we seek revenge, who will benefit? And this benefit has to reach beyond us to our families, our societies, and the entire ummah? Will the ummah of Muhammed SAW benefit if I seek revenge? Or will they benefit if I practice forgiveness? All Muslims have benefitted from Dr. Jitmoud’s actions even if we don’t realize. If nothing else, it has cracked the negative image of Islam for many people and softened their hearts towards Muslims. It’s way more than what we can say for ourselves! This man singlehandedly demonstrated the power of forgiveness. Now not only he but inshaAllah his entire family, including his deceased son, will reap the benefits of his actions for eternity. They have already been honored in this world, and InshaAllah will be honored in the afterlife as well. This is the story of a sincere believer. One wind destroys what it touches, while the other benefits everything it passes over. We all carry the wind in us, in the form of our souls. What we need to ask ourselves is, are we bearers of goodness or are we causing corruption? It needs sincerity, vision, and light from Allah SWT to see what it is we are really spreading. May Allah SWT allow us to be spreader of mercy, peace, tranquility, guidance, and elevation of Islam; and not otherwise. May Allah SWT cover our sins and protect us from the evil of ourselves and evil of others. May Allah SWT allow us to honor His religion and let us die with sincerity of La ilaha illal lah Muhammed Rasul Allah. *For a deeper understanding of this topic, please read chapters on ‘afw’ in Riyad us Saliheen, Bukhari, Tirmidhi, and other ahadith books.